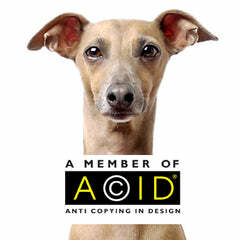 Two crazy dog ladies (sisters too) with five Italian Greyhounds, doing something we love – designing beautiful bedding for dogs that is super-comfy, stylish and practical. And we're learning to run a small business as we go. Who knew back in 2010 when we sat on the sitting room floor hand-sewing a Snuggle Bed for Anna and Charley that it would lead to Charley Chau! We posted photos on Facebook of what is now our signature Charley Chau Snuggle Bed and we were inundated with requests. That's how Charley Chau was born. No shiny business strategy, no big shiny plan – just a funny little idea that we thought might be a quirky little hobby. Since we launched in 2010 the most amazing things have happened. We left our old day jobs behind to run Charley Chau full time, we were named Fusion 2014 Entrepreneurs of the Year, Waitrose and Ocado (Fetch) now stock Charley Chau beds and blankets! But actually, the most amazing thing that has happened is that the word has slowly spread about Charley Chau - and almost all of that is thanks to our fabulous customers who have ordered Charley Chau for their own dogs and then recommended Charley Chau to their friends! The support we have from our customers is just incredible and they're now spread over thirty-five countries around the world! We feel very lucky indeed. We design dog beds and blankets that are super-comfy, stylish and practical. Comfort of the dogs has to come first but style and performance are hot on its heels – and we work to a mantra of machine washable everything! We're dog people and we understand the problems that dog people face when searching for good quality beds ad blankets for their dogs. We're also proud supporters of British manufacturing with all of our fabric beds and blankets made with love in England to the highest standards. We’re always working on new ideas, prototyping, testing, changing, testing some more … nothing is launched until we, and our army of product testers (our own pack and lots of others too) are 110% happy with it. The Kennel Club featured our company on the Crufts website and the article is worth a read for an insight into our design ethic: “Charley Chau – a new breed of luxury dog bedding company”. Our five little monkeys are the inspiration for Charley Chau so we have a lot to thank them for, not just because they’re ace bed testers but because they have literally turned our lives upside and for the better! We’d love it if you stayed in touch – we’re online every day sharing photos of our gang and chatting to our customers & other friends on Facebook, Twitter and Instagram. p.s our official charity is Forever Hounds Trust (formerly GRWE - Greyhound Rescue West of England) and we have designed a bed (the Forever Hounds Trust Big Memory Foam Dog Bed) to raise money to support their amazing work caring for Sighthounds in need. Do pop over to the Greyhound Rescue West of England website to find out more: www.foreverhoundstrust.org.